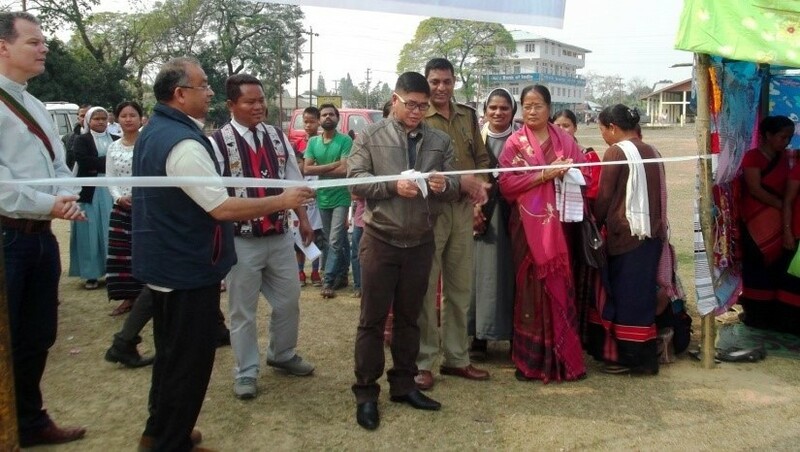 Seva Kendra Arunachal East, the Social Service wing of the Diocese of Miao organized a two-day Self Help Group Mela in Diyun, Changlang District on 11th and 12th February 2015. Inaugurating the event, respected EAC, D. Gadi of Diyun Circle, lauded the initiatives taken by the Seva Kendra in this region especially in Diyun circle. “I am extremely happy and I want to congratulate Seva Kendra Arunachal East for its great contribution to the people in this region”, he said. Fr. Franc from Netherland along with Fr. Sebastian were also there for the Mela to encourage the Self Help Groups. There were a total of 25 Self Help Groups put up stalls of traditional dresses, wood-carving items, artificial flowers, and handicraft items. The trainees from Seva Kendra Training Centre at Namphai I also put up a few stalls that attracted huge footfalls to the Mela. Stalls that sold different snacks items and meals prepared by the SHGs also brought in a lot of people to the Mela. Fresh vegetables brought by the SHG members had a very good demand. Responding to the request of the people of this area, the Seva Kendra promised to organize many similar event for the in Diyun Circle.